This PDF 1.4 document has been generated by Mozilla/5.0 (Windows NT 6.3; Win64; x64) AppleWebKit/537.36 (KHTML, like Gecko) Chrome/63.0.3239.84 Safari/537.36 / Skia/PDF m63, and has been sent on pdf-archive.com on 01/03/2018 at 15:45, from IP address 157.49.x.x. The current document download page has been viewed 173 times. will be treated as without ticket and charged as per extent Railway Rules. photograph /Credit Cards issued by Banks with laminated photograph/Unique Identification Card &quot;Aadhaar&quot;. transferred in the account in which transaction took place in case of e-Tickets etc. refund of service tax amount. 6. General rules/ Information for e-ticket passenger have to be studied by the customer for cancellation &amp; refund. This ticket is booked on a personal user ID and cannot be sold by an agent. If bought from an agent by any individual, it is at his/her own risk. ा आप जानते ह िक आपके िकराये का 43% दे श के आम नाग रक वहन करते ह? Are you aware that 43% of your fare is borne by the common citizens of the country? Show your support and help India become corruption free.GO to http://pledge.cvc.nic.in and get a certificate from Central Vigilance Commission. 1. 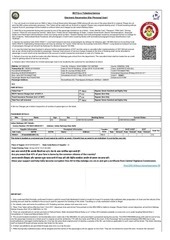 For details, rules and terms &amp; conditions of E-Ticketing services, please visit www.irctc.co.in. Dial 139 or SMS RAIL to 139.
fare ticket for the same. 5. E-ticket cancellations are permitted through www.irctc.co.in by the user. waitlisted/confirmed and RAC will appear in the chart. 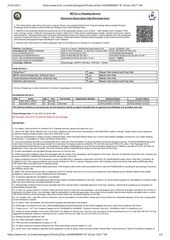 certificate must be sent to GGM (IT), IRCTC, Internet Ticketing Centre, IRCA Building, State Entry Road, New Delhi-110055 after filing TDR online within prescribed time for claiming refund. 10. In premium special train cancellation is not allowed. 12. RAC/partially confirmed Ticket can be cancelled upto thirty minutes before scheduled departure of the train. However, refund will be granted as per provisions of extant Railway Refund Rule. before the scheduled departure of the train. 14. For Suvidha Train , only 50% refund is allowed in case of cancellation of Confirm/RAC tickets upto 6 hours before the scheduled departure of the train or preparation of chart whichever is earlier. schedule departure of the train from the passenger's boarding station. 16. Passengers are advised not to carry inflammable/dangerous/explosive/articles as part of their luggage and also to desist from smoking in the trains. 17. Contact us on: - 24*7 Hrs Customer Support at 011-23340000/011-39340000 , Chennai Customer Care 044 – 25300000 or Mail To: care@irctc.co.in. This file has been shared by a user of PDF Archive. Document ID: 00740551.